Just wanted to give a plug to a local business. 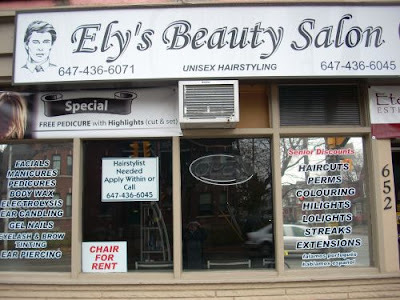 Ely's Beauty Salon set up shop just over a year ago at 652 Lansdowne (at Wallace, beside Peppers). I decided to give it a try this week and was really impressed. I was really pleased with the cut and colour I received and the price was much cheaper than that charged at the salon I usually trek to downtown. I'd highly recommend Ely. She's really personable and interesting. She emigrated to Canada from Equador. with her parents and siblings in 1986. In Equador, she studied to be a social worker at university. She worked with women and young people in trouble with the law before coming to Canada. Her social work credentials weren't accepted here and because her English was limited, she spent her first five years here working in a factory. She says those were the worst five years of her life. She ended up going back to school and getting trained as a stylist.